A recent article, "Do You Have Pass Along Cards? ", written by Jason Alba, was reposted on the Collaborative Career Conversations website by master career guru Nancy J Miller. In the article, it proposed, very sensibly, that when we make a new contact, we leave them something unique to remember us by; something engaging that makes us memorable. Jason proposed that we leave an entertaining card - not a business card - that helps us 'stick' in our new contact's memory. Giving a new contact a little something to remember me by is a great idea, and I like that it is not necessarily as 'filthy lucre' or as mercantile as a business card (showing my Kiwi roots here!). While I like the idea of creating a memory, I don't think that paper is the right way to go. You see, I have gone e-file. If offered paper, I tend to refuse it. If I do take it from politeness, when I get home, paper goes in the recycling. If it is going to be - or needs to be - kept, then it will need to be scanned, and then go into the recycling. For other people like myself, who now have all their files as electronic only versions, if I give a client a piece of paper, I am giving them a problem: what do they do with a piece of paper when they get home? So, thinking more on Nancy's repost, I pondered how I could avoid adding an extra job for a prospective client, while making myself more memorable. My solution was QR codes. I could have QR codes on my phone, which I could beam to new contacts... perhaps a range of codes from which I would chose a particular - and suitable - one. This would fit better with who I am, and keeping my footprint - and therefore my client's footprints - lower impact. 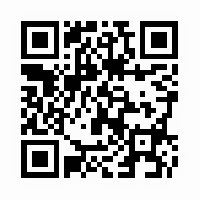 So, spurred into action, I have ordered some QR codes. Now I only need think on what I put at the desintation. Thanks for the inspiration, Nancy! Wow, Sam. What a great idea. We have apps for business cards and digital cards but they are ever changing and boring digital connections. You are one step ahead. You can be in charge of your own data with QR Codes. I have one on my business card, but I hadn't thought of using it instead of a business card. You can be much more creative with a QR Code. Cheers, Nancy - much appreciated! Great application that you have made now though: advertising your book with a QR code... put it as a jpg on your phone and show everyone!